Kevin Kelly was 17 years old when he met Walter Payton. 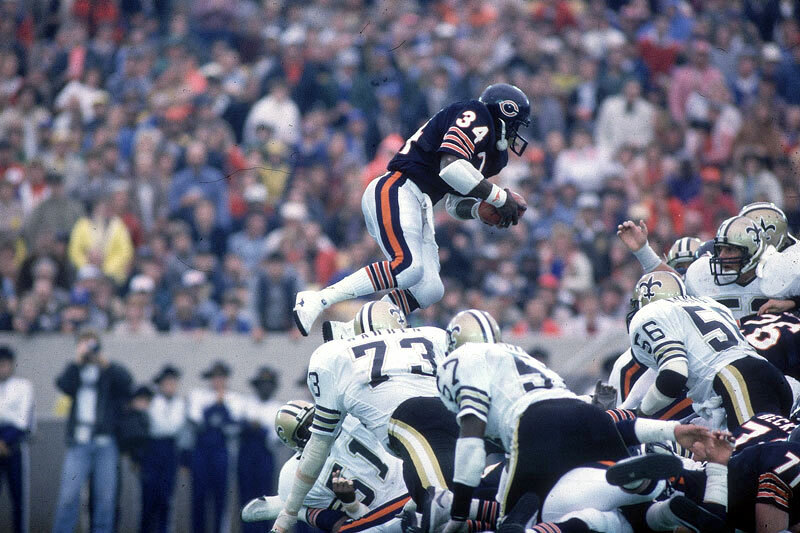 It was 1982, and the Bears running back had just finished his seventh NFL season—at age 27 already the fifth-leading rusher in NFL history. Payton was nearing the peak of his celebrity, elusive and powerful on Sundays, and unstoppable in the mind’s eye of 17-year-old boys on varsity football teams in Illinois. Kelly, who played at Barrington High in Chicago’s northwest suburbs, liked to train late at night during the offseason at a local 24-hour health club because the weight room was usually empty at that time. 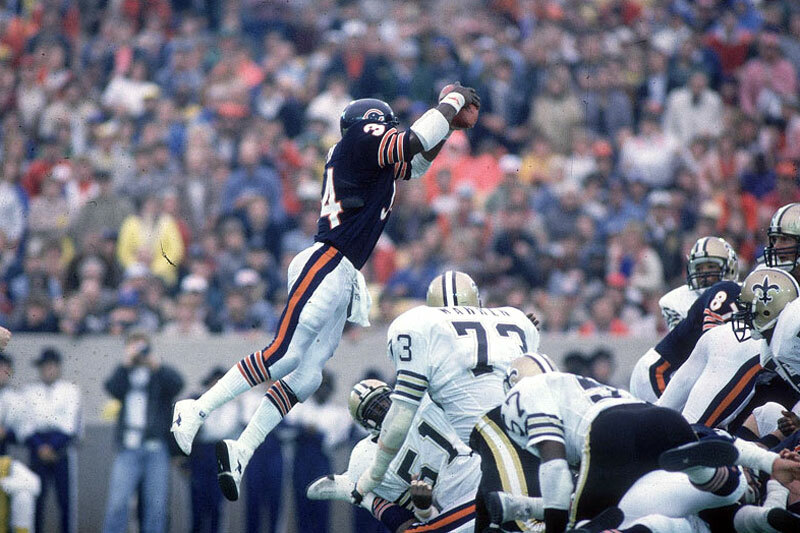 One Friday, Kelly arrived at midnight, scanned the room—and there was Walter Payton. Kelly wondered why Walter Payton would be working out at midnight. He thought, He must be in here because he wants to be alone. So the kid steered clear of the star and began his routine on the other side of the room, while watching Payton out of the corner of his eye. The story of Kevin Kelly, or rather, what happened next, is about a search. 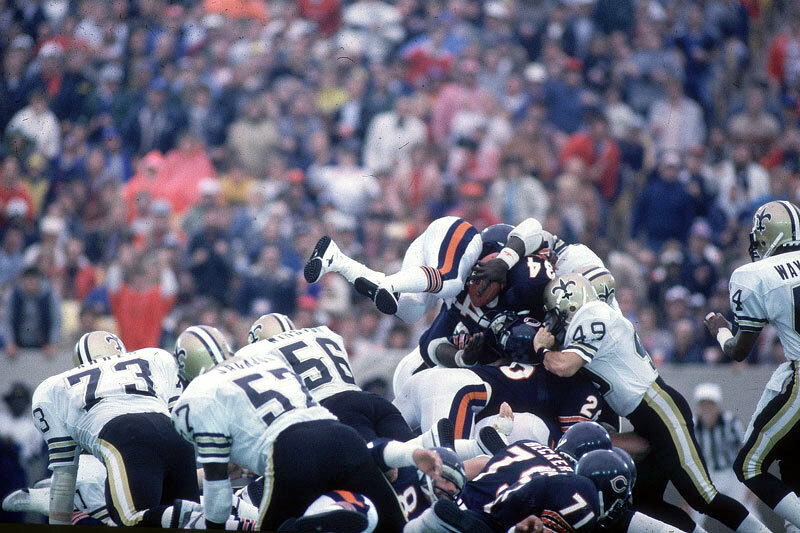 Kelly is but a footnote in Payton’s public legacy—a quote in a newspaper relegated to microfilm; a pair of legs on a television broadcast churning up a steep hill in vain pursuit of a man called Sweetness. And yet for Kelly, Payton became a compass. True north led him to a football life, from Chicago to Miami to Indiana to Cleveland to San Diego, where he’s college scouting director for the Chargers, with the near-impossible mission of finding the next Walter Payton. Kelly would become a friend to Payton, a confidant, a motivator and, late in the Hall of Famer’s life, a shepherd for his only son, Jarrett. The kinship began that night in the gym. Kelly recalls that Payton really didn’t enjoy heavy lifting (he would later challenge Kelly to explain how the bench press translated to the football field, and if Kelly could convince him, he’d try it out). Instead, he would power-clean 100-pound dumbbells, raising them from the floor to above his head in rapid succession, pumping like engine pistons as if he were ripping away from a tackler. The two ran on the club’s track that night—interval sprints, with Payton bursting around the corners—and they played basketball, one-on-one until 3 a.m. Afterwards, the two sat in the locker room, dripping with sweat, and a thought rushed to the front of Kelly’s mind. Nobody is going to believe me. I don’t even have his autograph! Above: A clip from a Bears-Falcons telecast in 1984 showing Walter Payton and Kevin Kelly, then in college, running the hill in Arlington Heights. Because of camera difficulties at the time of filming, only their backs were seen on screen. Kelly learned how to run by chasing Payton, who lived life on the balls of his feet, the imprint of his heel never making a track in the dirt. They ran at Payton’s whim, and not just the hill. Payton would occasionally get the itch in the middle of an offseason sponsor dinner or magazine photoshoot. Kelly could vault the first 10 or so by planting one cleat in the front of the bale and jumping over. For the rest he could only sprint around them. Meanwhile, Payton was clearing them as if they were track hurdles. Sometimes he leapt head-first over the bale and rolled to his feet, à la his signature goal-line dive. There was a nearby forest preserve full of pine trees, and Payton figured he could train his body for punishment and his vision for open lanes if he held a football and sprinted through the woods, avoiding the obstacles he couldn’t run through. Kelly trailed behind, slowly navigating the brush. “He would run through there and dodge the trees like they were tacklers,” Kelly says. “I mean, full-speed—branches would be flying. I think in the six or seven summers, twice he ran smack into a tree and both times I was like, Oh my God! Kelly’s fellow freshmen included Alonzo Highsmith and Jerome Brown, respectively the eventual No. 3 and 9 picks in the 1987 draft. The scout team defense included Danny Stubbs and Winston Moss. The scout team quarterback was Vinny Testaverde. More than a third of the roster wound up playing in the NFL. As a non-scholarship athlete, Kelly was placed in a regular dorm, which meant he was the only inhabitant of his floor when summer practices began. One night after midnight the phone in the hallway started ringing, over and over again. It hit Kelly that night on the phone in Miami—those daily brushes with pure relentlessness. He didn’t know if he could match that intensity, but he knew what it looked like. In the late ’90s, Payton’s celebrity in Illinois was so large he had to sneak into his son’s high school football games and watch from on top of the press box to avoid being mobbed by fans. The coach of that St. Viator High team was Kevin Kelly. After earning a national championship ring with Miami in ’83, Kelly had transferred to Indiana in search of more playing time and as a senior was a captain for the Hoosiers’ ’87 Peach Bowl team. After graduating he had assistant coaching stints at Indiana, Lake Forest College, John Carroll University and Case Western before taking the head coaching job at St. Viator. Upon his arrival, Payton visited his cramped new office and wrote the number 4 on a whiteboard. The year after Kelly arrived at St. Viator, Jarrett, who had played soccer through his sophomore year, switched to football to be Kelly’s quarterback. Payton had a request for the coach: Help Jarrett discover the work ethic I’ve taught you. Together Kelly and Jarrett found their four-yard play—a quarterback sweep. Then, in Jarrett’s senior year, the team’s starting running back went down with an injury, and Kelly asked Jarrett to switch positions. Payton had a request for Kelly: Help Jarrett discover the work ethic I’ve taught you. St. Viator won the 1998 conference title on the strength of more than 2,800 all-purpose yards from Jarrett, who was named Illinois player of the year. The following January he held a press conference to announce his school of choice. At that point America didn’t know of the physical and mental anguish his father was in. Secretly, Walter was being destroyed by a rare liver disorder. He’d visited the Mayo Clinic in Rochester and had exploratory surgery, with no success. Payton, who had never fluctuated more than five pounds his entire career, was a waif. “It went fast, and he tried to stay out of the limelight,” Kelly says. Kelly’s first son was born a few months later. As a kid in central Indiana, Payton Kelly asked his father why his name wasn’t spelled with an e, like that of the Colts’ quarterback. Dad gritted his teeth and sat his son down to watch highlights of his old friend, and to tell the story. 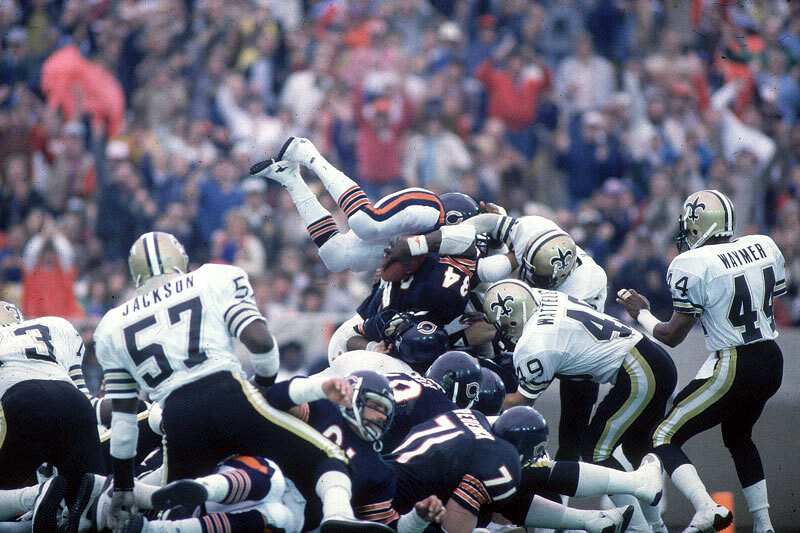 The stories of Walter Payton’s single-mindedness are legion. Kelly knew him to wear a pair of leather shoulder pads from his college days long after the NFL converted to plastic. He recalls stumbling upon Payton’s equipment bag lying on the ground inside the gun range within Payton’s mansion after his retirement. In the bag he found those same beaten pads and an old Bears helmet with primitive cloth suspension, the kind worn in the ’60s. “It just looked like kiddie equipment,” Kelly says. If these were in his gun range, Kelly wondered, whose pads were sitting in the Hall of Fame? “He said they just sent off some pair of pads that always sat in his locker, but he never wore them,” Kelly says. Payton played through injuries of every kind, missing one game in his rookie season with a shoulder injury, then playing in 186 consecutive games until retirement. And he was quick to remind anyone who brought it up that he was forced to sit out that one game by the Bears’ trainers. That’s the kind of athlete Kelly is looking for as the Chargers’ scouting director. A few of Kelly’s hits over the years, according to three NFL personnel men who have worked closely with him: In 2003, as a Browns scout, he pushed hard for the franchise to take Tony Romo out of Eastern Illinois, who went undrafted and landed in Dallas. In 2005 with Cleveland, Kelly was instrumental in identifying Kent State quarterback Josh Cribbs as a priority undrafted free agent. (Cribbs would make two All Pro teams as a return specialist.) In 2010 with Indianapolis, Kelly was high on Central Michigan receiver Antonio Brown, who ultimately went to the Steelers in the sixth round and had 129 receptions in 2014, the second-highest single-season total in history. In 2013 he pushed for the Jets to draft defensive end Sheldon Richardson out of Missouri with the 13thpick. They did, and Richardson was the 2013 defensive rookie of the year. Every year, Polian says, he’d ask Kelly who his guys were in the upcoming draft. Almost invariably, those guys would make it somewhere. In the decade and a half since Payton’s death, that same ambition that Kelly has been chasing for a decade—and which Jarrett sees in Kelly’s son—has put the final shadowy chapter of Payton’s life into perspective. While outwardly maintaining his buoyant public persona, Payton in retirement was constantly in search of direction and purpose, veering from one pursuit to the next. Quietly separated from his wife, he tried his hand at television, auto racing and restaurants. Like many players, he continued to use painkillers after his playing days were over. As detailed in the final chapters of Jeff Pearlman’s 2011 biography Sweetness, he also suffered from depression and told people of suicidal thoughts. His greatest post-career ambition—one that might have offered him some semblance of the professional fulfillment he got on the football field—was to own an NFL team, but that quest was derailed by dissension among a group of investors (including Payton) that tried to bring an expansion franchise to St. Louis in 1995. Jacksonville and Charlotte got the new teams that year, and St. Louis got the Rams from Los Angeles. Payton aspired to be team president in addition to co-owner, and Kelly would have had a coaching role. Kelly often thinks of his days under Payton’s tutelage but doesn’t speak about it very much. He’s not interested in writing a book, and he never even dared tell his college teammates that he spent his summers training with Sweetness, because he knew they wouldn’t believe him. But above his desk at his house in Indiana hangs a portrait of that hill back in Illinois. While Kelly was coaching Jarrett in high school, the hill was bulldozed and manicured to become part of a par-3 golf course. Walter had a photograph taken and sent the picture to Kelly as a gift. Before the NFL scouting jobs and the championship at St. Viator, before Indiana and Miami, and even before the hill, there was one unlikely night that set a kinship in motion. A 17-year-old arrived home at 4 a.m. to find his father up and reading the morning paper. The son explained that he’d met Walter Payton and worked out with him for three hours, and the two had then had a beer. He showed his father the napkin with Payton’s name and phone number. Kelly’s dad grounded Kevin indefinitely. That afternoon Kevin called Walter to tell him the bad news. 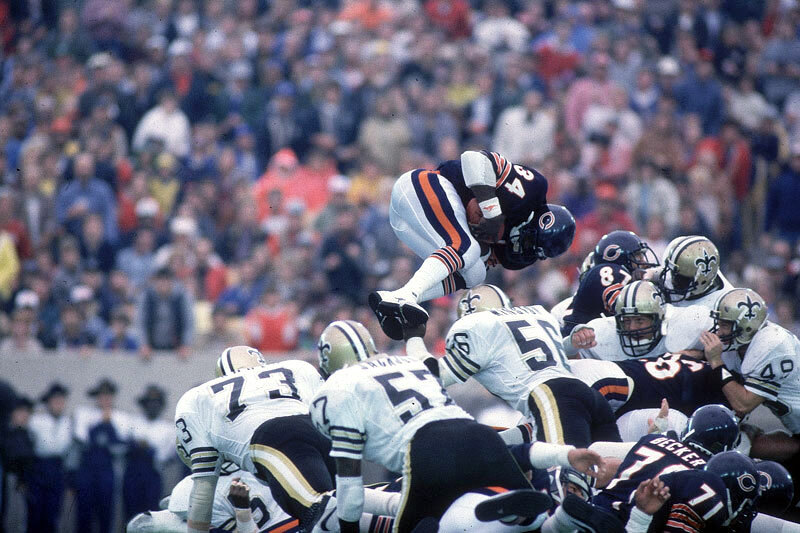 So that evening, while Mr. and Mrs. Kelly and their three sons were sitting down to dinner, Walter Payton arrived at the front door, in the flesh. Mr. Kelly, I need your son to help me work out. “I think my dad choked on his pork chop,” Kelly says.